Excellent visualization of distance education enrollment patterns. 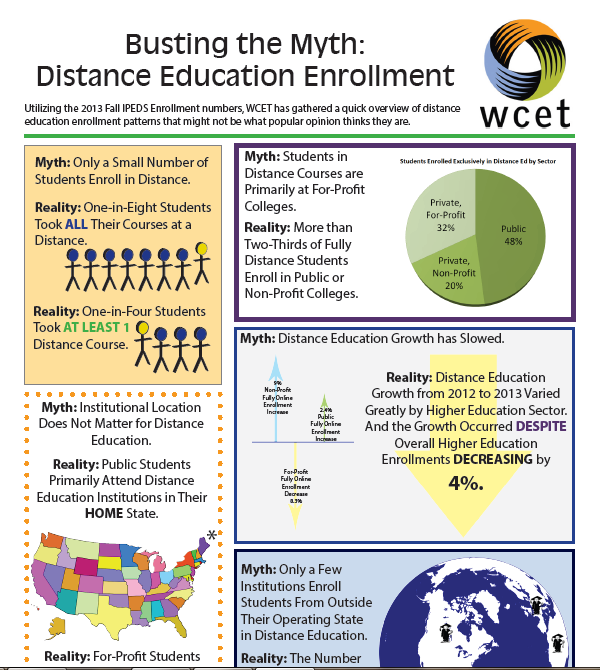 This infographic dispels some of the misconceptions and common myths related to Distance Education. WCET has devoted a series of blog posts that examines and explains the IPEDS Fall 2013 survey results. Below is a link to the entire infographic. I attended an excellent webinar on January 8, 2015 sponsored by WCET. Four experts shared their predictions of edtech trends for 2015. I’ve posted a link to the recording and some of the resources shared during the panel presentation including my notes. Thanks WCET for putting together a great group of panelists! Learners require on-demand access to a digital content system and faculty require increasing support. Jeff Borden reminds us that film projectors, tv, moocs, etc. were all were going to revolutionize education. Share student success models with faculty about how ed tech can better serve students. Connections can build relationships. Connect students to experiences, institutions, other students, professions. Build connections between students & content. What steps can institutions take to ensure technology is used effectively for teaching? 2014 in eLearning blog review. Thank you WordPress! I just stumbled upon an email from WordPress that included a data visualization summary of my blog stats from 2014. Very cool! I wonder what the hot eLearning topics will be in 2015. My prediction is that MOOCs will not be one of them. Check out my blog’s “annual report” below. My goal is to improve upon my eLearning Blog stats for 2015. Happy New Year!!! 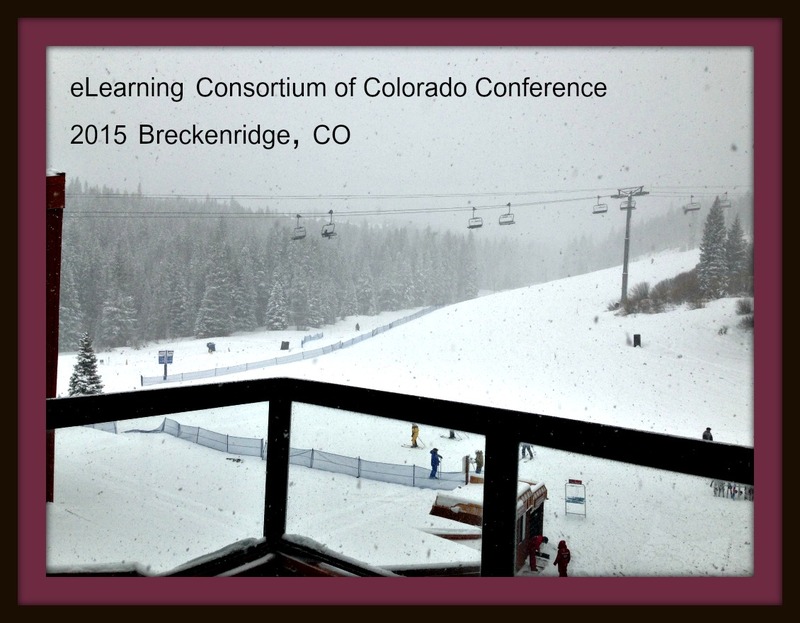 Submit a Proposal to the 2015 eLCC Conference! I’m very excited that we’ve received so may excellent proposals for the Teaching and Learning with Technology Symposium (TLTS). The TLTS is a FREE faculty development event and a great opportunity for you to network with fellow educators throughout Colorado. Faculty and staff at eLCC member institutions are invited to attend the Symposium to be held on October 24th, 2014 at MSU Denver on the Auraria Campus. Space is limited so register right away if you plan to attend. A course in which all or nearly all of the organized instruction is conducted online or by distance learning methodologies. 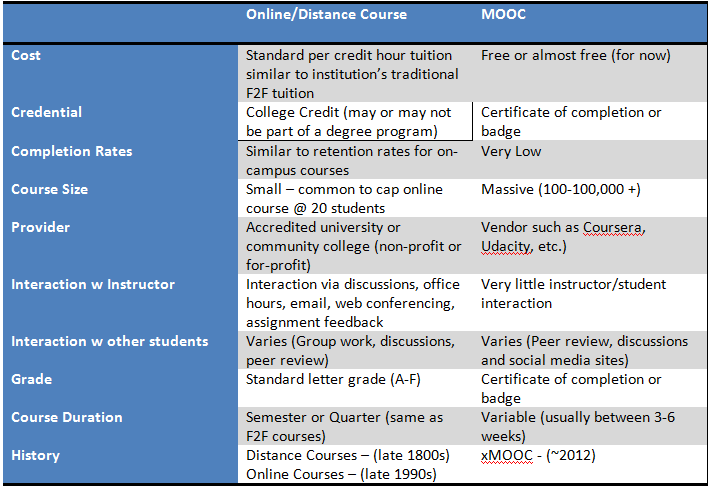 I’ve organized some of the differences between a traditional online/distance course in higher education and a MOOC in the table below. I’m sure there may be other differences I’ve missed, but these are a few of the differences that I often think about when contrasting MOOCs with traditional online courses.